Here, more than 20 experts from leading research institutes around the world present the entire scope of this rapidly developing field. In so doing, they cover a wide range of topics, including the characterization and investigation of structural, dielectric and piezoelectric properties of ceramic materials, a well as phase transitions, electrical and optical properties and microscopic investigations. 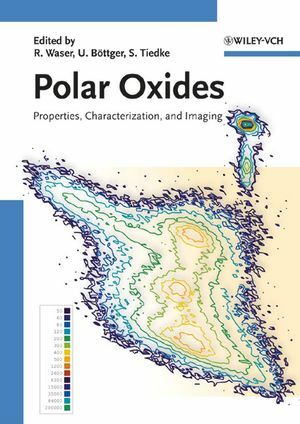 Another feature is a complete profile of the properties of polar oxides -- from their proof to their latest applications. Throughout, the authors review, discuss and assess the material properties with regard to new and advanced characterization and imaging techniques. For physicists, physicochemists, semiconductor and solid state physicists, materials scientists, and students of chemistry and physics. Rainer Waser is Professor of Physics at the faculty of Electrical Engineering and Information Technology of the RWTH Aachen University and Director at the Institute of Solid State Research (IFF) at the HGF Research Center J&uuml;lich, Germany. In 1984, he received his PhD in physical chemistry at the University of Darmstadt, and worked at the Philips Research Laboratory, Aachen, until he was appointed professor in 1992. His research group is focused on fundamental aspects of electronic materials and on such integrated devices as non-volatile memories, specifically ferroelectric memories, logic devices, sensors and actuators. Professor Waser's co-editors are Dr. Ulrich B&ouml;ttger, who works alongside him at the the faculty of Electrical Engineering and Information Technology of the RWTH Aachen University, and Stephan Tiedke of the aixACCT Systems GmbH company. 1 Dielectric Properties of Polar Oxides (U. B&ouml;ttger). 1.4 Theory of Ferroelectric Phase Transition. 2 Piezoelectric Characterization (S. Trolier-McKinstry). 2.2 Measurements in bulk materials. 2.3 Measurements in thin films. 3 Electrical Characterization of Ferroelectrics (K. Prume, T. Schmitz, S. Tiedke). 4 Optical Characterization of Ferroelectric Materials (C. Buchal). 4.1 Introduction: Light propagation within anisotropic crystals. 5 Microwave Properties and Measurement Techniques (N. Klein). 5.2 Basic relations defining microwave properties of dielectrics and normal/superconducting metals. 5.3 Surface impedance of normal metals. 5.4 Surface impedance of high-temperature superconductor films. 5.5 Microwave properties of dielectric single crystals, ceramics and thin films. 5.6 General remarks about microwave material measurements. 5.7 Non resonant microwave measurement techniques. 6 Advanced X-ray Analysis of Ferroelectrics (K. Saito, T. Kurosawa, T. Akai, S. Yokoyama, H. Morioka, H. Funakubo). 7 Characterization of PZT-Ceramics by High-Resolution X-Ray Analysis (M. J. Hoffmann, H. Kungl, J.-Th. Reszat, S. Wagner). 8 In-Situ Synchrotron X-ray Studies of Processing and Physics of Ferroelectric Thin Films (G. B. Stephenson, S. K. Streiffer, D. D. Fong, M. V. Ramana Murty, O. Auciello, P. H. Fuoss, J. A. Eastman, A. Munkholm, C. Thompson). 8.2 Growth of ultrathin ferroelectric films. 8.3 Observation of nanoscale 180◦ stripedomains. 9 Characterization of Polar Oxides by Photo-Induced Light Scattering (M. Imlau, M. Goulkov, M. Fally, Th. Woike). 10.3 AFM nanodomain tailoring technology. 10.5 Nanodomain superlattices tailored by multiple tip arrays of HVAFM. 11 Pyroelectric Ceramics and Thin Films: Characterization, Properties and Selection (R. W. Whatmore). 11.2 The physics of pyroelectric detectors. 11.3 Measurement of physical parameters. 11.4 Pyroelectricmaterials and their selection. 11.5 Pyroelectric ceramics and thinfilms. 12 Nano-inspection of Dielectric and Polarization Properties at Inner and Outer Interfaces in PZT Thin Films (L. M. Eng). 13 Piezoelectric Relaxation and Nonlinearity investigated by Optical Interferometry and Dynamic Press Technique (D. Damjanovic). 13.3 Investigation of the piezoelectric nonlinearity in PZT thin films using optical interferometry. 13.4 Investigation of the piezoelectric relaxation in ferroelectric ceramics using dynamic press. 14 Chaotic Behavior near the Ferroelectric Phase Transition (H. Beige, M. Diestelhorst, R. Habel). 14.2 Dielectric nonlinear series-resonance circuit. 14.3 Nonlinear nature of the resonant system. 14.4 Tools of the nonlinear dynamics. 14.5 Experimental representation of phase portraits. 14.6 Comparison of calculated and experimentally observed phase portraits. 15 Relaxor Ferroelectrics – from Random Field Models to Glassy Relaxation and Domain States (W. Kleemann, G. A. Samara, J. Dec). 15.5 Dynamics of the dipolar slowing-down process. 15.7 Domain dynamics in uniaxial relaxors. 16 Scanning Nonlinear Dielectric Microscope (Y. Cho). 16.2 Nonlinear dielectric imaging with sub- nanometer resolution. 16.3 Higher order nonlinear dielectric microscopy. 16.5 Ultra High-Density Ferroelectric Data Storage Using Scanning Nonlinear Dielectric Microscopy. 17 Electrical Characterization of Ferroelectric Properties in the Sub-Micrometer Scale (T. Schmitz, S. Tiedke, K. Prume, K. Szot, A. Roelofs). 18 Searching the Ferroelectric Limit by PFM (A. Roelofs, T. Schneller, U. B¨ottger, K. Szot, R. Waser). 18.2 Polycrystalline ferroelectric PTO thin films on platinized silicon substrates. 18.3 Separated lead titanate nano-grains. 19 Piezoelectric Studies at Submicron and Nano Scale (E. L. Colla, I. Stolichnov). 19.2 Investigating cycling induced suppression of switchable polarization in FeCaps. 19.3 Size effect on the polarization patterns in µ-sized ferroelectric film capacitors. 19.3.1 Downscaling of ferroelectric capacitors. 19.4 Direct observation of inversely-polarized frozen nanodomains in fatigued Fe- Caps.